Home » 1950s » >Two 1950s projects finished! 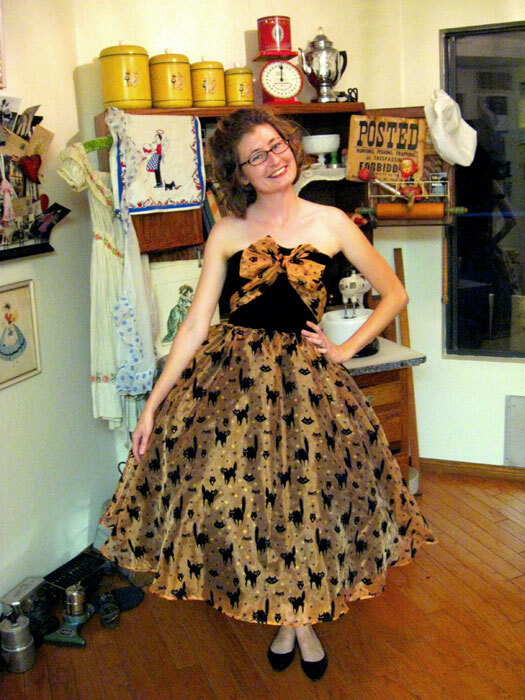 >I finished my halloween kitty dress tonight! Yay! I bought the pattern on Etsy from The Playful Needle. The original didn’t have ties like this, but it always makes me feel more secure to have optional neck ties. I made these long enough that they can wrap around a variety of ways but I like the way my husband came up with- a little bow at front and tied around the back in a knot. 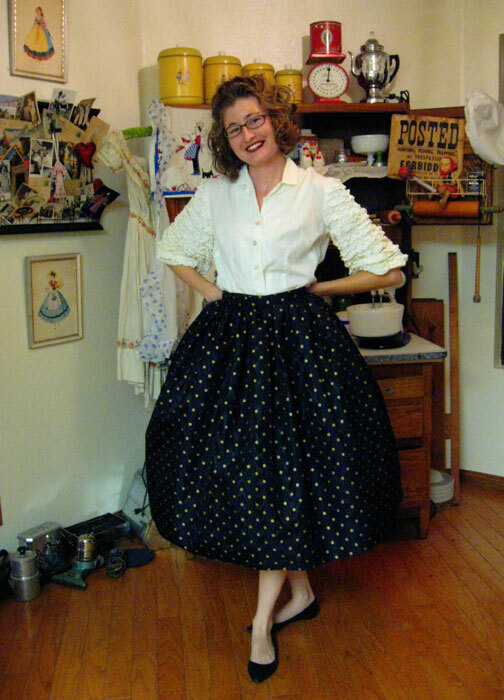 And here’s a petticoat/slip I made from a 90s prom dress. My new floofy petticoat showed through with the stripes so I thought gold polka dots would look cute. I just got this shirt this week, too, from a little vintage store around here. I look so much like my mom in this picture it’s scary. 8 Comments on >Two 1950s projects finished! >"but it always makes me feel more secure to have optional neck ties."Exactly! I have a growing stash of ribbons and vintage bow ties, all ready at a moment's notice.So so so so cute! I love the look of the longer full skirt, most of mine to just below my knee. Such a flattering length, you look great! >Lovely! You look as if you are ready to burst into song….happy song, of course! With lots of twirling about! >So cute! 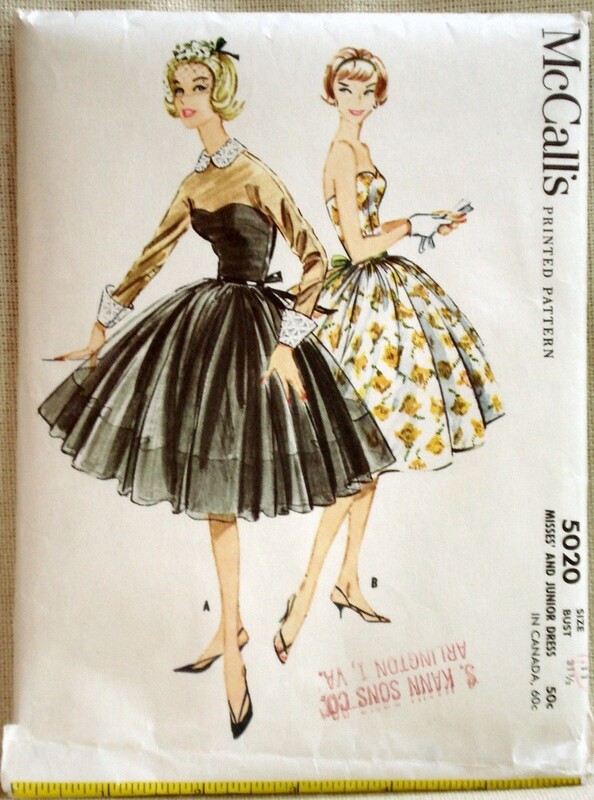 I wish I had the figure to wear 50s clothes…I think your petticoat needs one more ruffle around the bottom though. >You look great! Both outfits are so cute. >Hi – Julia from The Playful Needle here! Just came across this entry and I have to say that dress turned out so well! Such a clever use of the fabric, too – I love to see an old pattern updated.